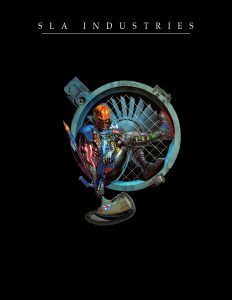 As the original book was produced in 1993, with desktop publishing still finding its feet and digital archival options both rare and expensive, all the original scans and files were, inevitably, lost. 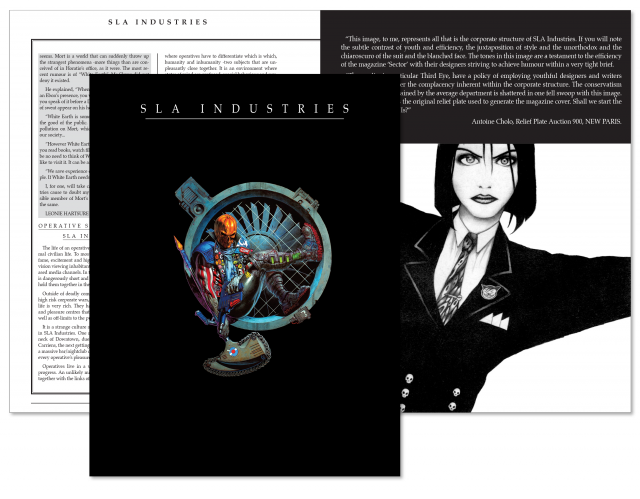 Nightfall’s design team worked arduously scanning one of the remaining unopened original first print copies of SLA Industries from the archives and other, later, editions to get the best possible copies of long lost artwork. The cover art, a Glenn Fabry painting from a John Beeston ink drawing, was taken from the later hardcover edition, as were the included fiction pieces, while the text was scanned and OCRed from the earlier editions. The scanned art was retouched to get it as close to original as possible, while the text was sized to fit the US Letter size of the reprint, differing from the original European A4 size, while trying to keep the book feeling as close to the first-printing as possible. Nightfall Games, in advance of the forthcoming “SLA Industries: Cannibal Sector 1” miniatures game, is proud to bring the 23-year old classic to a retailer near you, and will be following it up with two new books that have not been made available in print since their PDF release; “Hunter Sheets: Issue 2” and an anthology of the smaller “Data Packets”. Buy the PDF for £9.99 or get the printed hardback for £35 from your local games store.